I thought I had done everything right. I had opted out of a sonogram, ate organic food, used organic products, and exercised while carrying my son, River. He was born naturally, via water birth, in 2008, without any complications, weighed nearly 9 pounds, and we chose to delay vaccinations. He was a happy baby, the epitome of health, developed normally, was in the 90th percentile for growth, and was never ill. He interacted well with everyone, had great eye contact, played with toys, smiled, laughed, pointed at items in books, loved to dance, made animal sounds on request, had some words and babbled like crazy. There was no indication that anything was wrong. Between 15 to 18 months, he still wasn’t talking much, but he was very physically active. We were told that he was focusing on his physical development and language would just come a little later. The babbling continued, but never really turned into words. We also started seeing some odd behaviors. One night, he screamed in terror when I put him in the bathtub; an activity he usually loved. I immediately whisked him out, thinking the water was too hot. It wasn’t. From that day forward, bath time became a struggle. I was puzzled. Other issues included crying inconsolably when going into a grocery store or running off whenever we went somewhere. But, nothing really seemed wrong. He was imitating behavior, playing catch and still beaming his bright eyes and adorable smile at everyone. At 25 months old, River became a different child. He was addicted to PBJ sandwiches, threw tantrums daily and screamed in terror when his baby sister cried. We started distancing ourselves from society. Play dates, birthday parties, restaurants, all public places and events were avoided because River couldn’t handle the outing, and we couldn’t control or explain his behavior. Instead of playing on playground equipment, he would run off or just walk around it in a repetitive loop. We began taking him to baseball fields where we could close all the gates…and he could just run or walk the perimeter without escaping. He reminded me of an animal at the zoo, pacing the fence line. During this time, I had a horrible dream that my husband, River and I were sitting on some boulders at the edge of a clear mountain lake. Below the surface, the boulders formed a deep, dark hole. Suddenly, River scooted off his boulder and fell in. I watched in horror as he quickly plummeted into the abyss below. There was no way that we could save him. It was such a disgusting and helpless feeling. Looking back, it was extremely symbolic of what was happening. He was slipping away from us. We enrolled River in a private preschool program, hoping that would help, but he wasn’t like the other kids. He only used one word at a time to communicate and his rigid behaviors became a challenge for the staff. Music was the only thing that helped him through the day. The program director suggested that we get him evaluated, so the state-based Early Intervention program became involved. He qualified for therapy services due to global developmental delays. Having a psychology degree, I suspected what we were dealing with. Family and friends wouldn’t accept it without a formal diagnosis, but my grieving process had begun. How could my son have autism? At 3 years old, River was transitioned into a special needs pre-K at the public elementary school. He cried a lot, struggled with transitions, and didn’t participate much, preferring to just walk repetitive loops around the perimeter of the classroom. I was shocked and saddened to discover that he was the lowest functioning child in the room. In addition, he was missing a lot of school days from being ill. At home, he no longer played with toys, couldn’t catch a ball, wouldn’t point, interact or even smile much. His language development stopped and we had to communicate with him through picture cards (PECS). His life began to revolve around the iPad, which was how he was learning. He knew his ABC’s and could count to 20. He knew shapes, colors, numbers, uppercase and lowercase letters. We were told how smart he was, but he just couldn’t communicate it. River received his official diagnosis the summer of 2012, at the age of 4: Autism Spectrum Disorder. I wasn’t surprised. My bookshelf had already been filled with books about autism, sensory processing disorders and home therapy ideas. I had joined multiple online support groups and searched for avenues of support in my local community. This is how I came upon TACA’s Georgia Chapter. I attended my first “Real Help Now” conference in the fall and was blown away by the medical research that was going on. Having knowledge in both mental health and science, this piqued my interest. I was surprised to find that a leading researcher and biomedical doctor had an office 10 minutes from my home. Knowing that he didn’t accept insurance; However, I wasn’t ready to take that expensive leap. River’s second year in the special needs Pre-K was worse than the first. Day after day, I’d check River’s backpack for his daily report with hopeful anticipation. And, day after day, I became more and more depressed at having to see a status of “Rough Day.” I felt like I was the one failing. Between school and multiple private therapies, we were getting nowhere. River still wasn’t putting two words together to communicate, couldn’t focus on tasks, frequently flapped his hand in front of his face, and was sensitive to all kinds of sensory stimuli. He bolted/wandered off wherever we went, making it dangerous to take him anywhere, and forcing us to affix him with a radio tracking device. At school, teachers and staff had to have walkie talkies on them due to the number of times he escaped the classroom. He had to be corralled in the halls like an escaped animal. He fought and screamed, wasn’t potty trained, climbed furniture and was becoming destructive to his classroom and our home. His bedroom, which we had caringly put together before he was born, had become a war zone. He tore clothes off of their hangers, breaking the plastic hangers in the process. He shredded the cute animal wallpaper strip that I loved. He broke the shades on his window. A large hole gaped in the wall from him repeatedly banging the door handle into it. He even tore one side of his crib completely off of its metal bolts. He was like an angry caged animal. Several OCD symptoms also began to manifest, such as checking walls for outlets, hoarding and sorting piles of toys, needing to have his food a certain way and needing to have all doors open and all lights on. I cried the day his teacher called to tell me that several administrative staff had to come into the classroom to help them calm and contain him because he had been screaming and slamming himself into a bookshelf. This was the first time he had resorted to self-injury. By Christmas 2012, River had pretty much stopped eating. If we offered him anything, he would run away in a screaming fit. He was losing weight and looking sickly. By January, he was only eating hamburger buns, goldfish crackers, and Welch’s Fruit Snacks. I could not believe that this is what I was sending him to school with. This wasn’t healthy and I knew it had to stop. I was getting angry. My sweet, healthy little boy was in there somewhere and I was determined to get him back. I was ready to take the biomedical leap. We started our “recovery” journey in February 2013 by going gluten-free and scheduling an appointment with the nearby biomedical doctor. Things got worse before they got better. River was NOT happy about the new diet. It was very difficult for his teachers at school, but we all fought through the transition. I will never forget the day that he got off the bus and actually looked at me. Every day after school, I had to help him off the bus because his eyes were glazed over, seemingly drugged, as he stared off into the horizon. It was day 14 of the gluten-free diet and my son was “there.” That week, he said “bye-bye” to his bus driver, and said “thank you” to his bus aide, UNPROMPTED. We had our first biomedical appointment that same week. I went in with hope, having seen some changes already. We ran multiple tests which yielded several food allergies, a compromised immune system, yeast overgrowth, chronic internal inflammation and severe vitamin/mineral imbalances. The autism behavior books on my shelf began to be replaced by books on internal healing, supplements, and special diets. We continued with the diet, removed allergens, limited sugar/grains/starches, focused on organic, and began to avoid dairy, which cleared up his eczema, keratosis pilaris, and green stools. 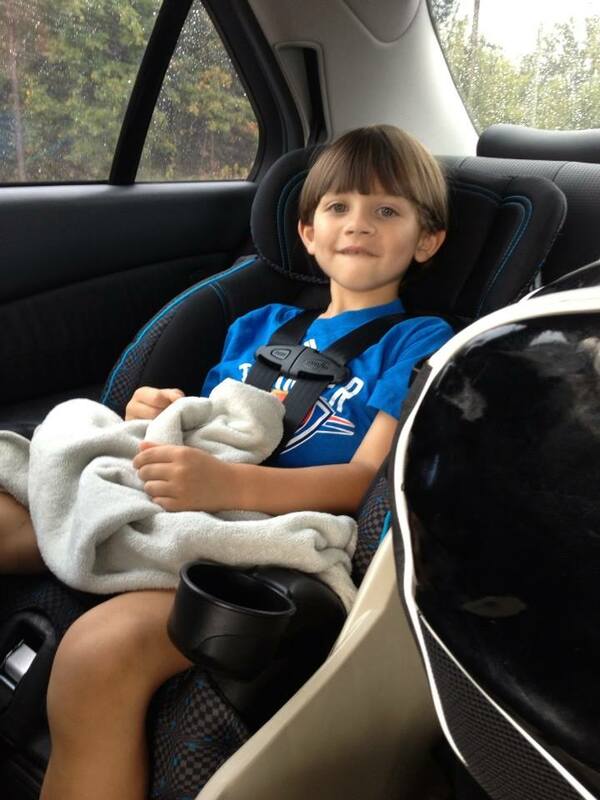 The fall of 2013, River attended Kindergarten in a self-contained autism class. River struggled with extreme anxiety and spent most of the time hiding in the classroom bathroom. Through the year; However, he gradually sat, attended and participated in activities for longer periods of time. He began interacting with peers, and was doing better with transitions. As the year progressed, he became fully potty trained, began talking in short sentences (mix of scripted and spontaneous), began answering yes/no questions, playing with his sister, and was able to catch a ball again. He stopped running off when we went out, began playing on playground equipment, was able to go grocery shopping, and could tell you his name and age when asked. River repeated kindergarten in a self-contained autism class in 2014. He was the leader of the class, served as the teacher’s helper, played and briefly conversed with other children, attended math in a regular Kindergarten class with an aide, and began to read. For the 2015-2016 school year, River attended 1st grade in a self-contained autism class again, but was mainstreamed in math and a reading segment without an aide. He also attended, science, art, music, and PE in a mainstream setting. For 2nd grade, we determined that the class size of a mainstream classroom was too stressful for him, so he was in a self-contained, moderate functioning class on a modified 2nd grade curriculum. He attended a resource classroom for reading, grade level math, and a typical 3rd grade class for science, specials, and lunch. River is currently 10 years old, and attending 4th grade in an Accommodated Curriculum Autism (ACA) classroom for higher functioning children. He is in a small class setting where he works on grade level curriculum with accommodations, and attends a typical 4th grade class in various settings. River’s language, vocabulary and comprehension are continually expanding. He has recently tested within the standard limits for listening comprehension skills, though he is still below average for oral expression. River loves math and recently had the 5th highest score in a class of 28 typical peers for number of correct multiplication and division problems within a timed period. In addition to his academic progress, River is very affectionate, conversational, requests our attention, asks questions, shows us things, loves to play board games, has a great imagination, a great memory, plays with toys appropriately and loves to play with his siblings. He loves public outings, eating out at restaurants, can go to movies, can ride a bike, and loves waterslides. He loves to play soccer and tennis, is on an adaptive swim team and has even been surfing. Most importantly, he has been focused and attentive in all of his therapies (Speech, OT, ABA, Gemiini, Neurofeedback, Vision Therapy/Reflex Integration Therapy, Auditory Processing Therapy)…so that he gets the most out of them. The biggest thing we’ve learned about River is that if you tell him he can do it, he will. River started with an ATEC score (Autism Treatment Evaluation Checklist) of 130 in January 2013 (170 is the worst possible score). He was considered low/moderate functioning. With the diet changes, alone, his score dropped to 62 in just 6 months. The turnaround in that time was amazing. During the testing, we found a metabolic disorder known as Pyroluria. We also found a homozygous MTHFR mutation, which told us that his body has trouble breaking down folic acid and he is unable to detox properly. Additional testing showed us that his body was loaded with toxins and heavy metals. With all of the medical testing, we determined what his body needed, and learned to supplement him correctly so that his body could eliminate the toxins that were burdening him. This has reduced his internal inflammation and allowed his body and brain to heal. With continued biomedical support, a clean diet, tweaking supplements as needed, and continuing to detox his body, River is now down to an ATEC score of 9 as of April 2018. A score of 10 is considered recovered, though some children may still need supports. He still has weaknesses in social areas and receptive/expressive communication. We still face some challenges, but piece by piece, we have been putting his autism puzzle together. Ultimately, we are restoring his health and optimizing his function. It has been 8 years since River began regressing. During the first several years of this journey, we felt a sense of relief every single night for just having survived another day. Today, I appreciate EVERY DAY for how much easier life has become, for the wonderful and loving little boy River has become. And, for the fact that River is getting to experience his childhood the way it was meant to be experienced. We have been on this journey to recovery for 6 years. It truly is a marathon and not a sprint. The journey has not been easy, or cheap, but it has been worth it. As parents of an autistic child, we have neglected our marriage, our health, our home, our families, our friends, and sadly, our other 2 children. We are not a perfect family, but we are a family with love, strength, and hope…hope that every little thing we do now will aid in a better, easier future for all of us. I came across this saying at some point during our journey and am unable to give credit to anyone, but it used to be a favorite saying of mine: “The special needs journey feels like standing on a line between giving up and seeing how much more you can take.” This is what autism used to feel like in our family, but we are walking further and further away from that line. We are experiencing recovery. Where there is hope, there is possibility. When there is possibility, there is no giving up. Originally from Montana, I am now a working mom with 3 small children in the suburbs of Atlanta. My first born son was diagnosed with Autism Spectrum Disorder at the age of 4 years old. Having a degree in psychology and an educational background in science, I began researching ways to help him. On my quest to recover him from the disorder, I stumbled upon a world of natural healing that has helped our entire family. As a researcher and teacher by nature, I have an internal drive to compile and share this information with others. I believe that we should all strive to live a more natural and healthy lifestyle. Please check back often as I continue to build and update the content of this site. Also, please feel free to send me suggestions for content that you would like to see. Beautiful boy and beautiful story. Best wishes. So happy for the progress for your sweet boy! Thanks for helping me get connected to biomed/recovery resources via the (depressing) babycenter group. My son has made huge improvents since starting GFCFSF and YL essential oils. Many blessings! Best wishes to you and your beautiful boy! A lot of what you wrote sounds a lot like my 2 year old. He goes tomorrow for an Autism eval. Your words give me hope that if he is diagnosed there is hope still. There are so many websites out there…but yours is by far the best organized, and just easiest to understand and follow. Thank you.